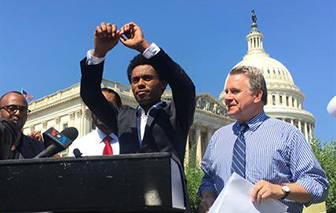 Rep. Chris Smith won House Foreign Affairs Committee approval in July of a resolution highlighting human rights violations by the current government in Ethiopia and calling for punitive actions against those government officials carrying out the abuses. "For the past 12 years, my staff and I have visited Ethiopia, spoken with Ethiopian officials, talked to a wide variety of members of the Ethiopia diaspora and discussed the situation in Ethiopia with advocates and victims of government human rights violations," said Smith, R-4th Dist. "Our efforts are not a response merely to government critics, but rather a realistic assessment of the urgent need to end very damaging and in some cases inexcusable actions by the government or those who act as their agents." Ethiopian-Americans are ready to say thank you. They're holding a $100 per person fundraiser for the lawmaker in Washington later this month. Smith "has done more for Ethiopia, and taken a greater interest in Ethiopian human rights and democracy, than any American politician," the invitation reads. "Now the Ethiopian-American community has a chance to thank him, to hear his thoughts about the future, and to tell him how we want Congress to help Ethiopians fight for freedom, human rights, democracy and dignity." Smith is up for re-election next year. So far, he is the only New Jersey Republican incumbent not targeted by the Democratic Congressional Campaign Committee. He is being opposed by former Asbury Park Councilman Jim Keady, who famously was told to "sit down and shut up" by Gov. Chris Christie; and Navy veteran Josh Welle, co-founder of a software company.